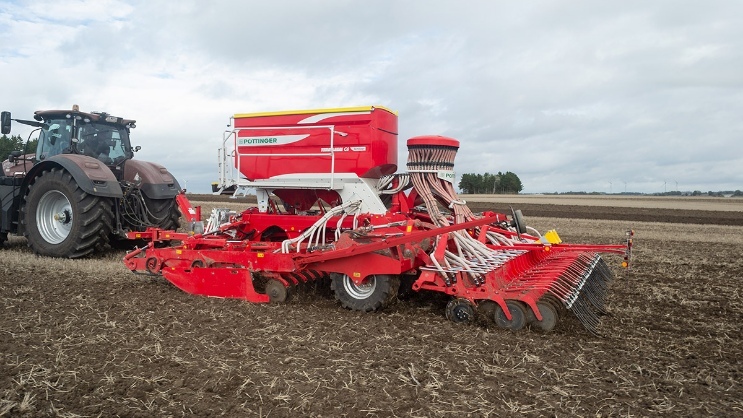 PÖTTINGER offers direct fertilisation on the proven TERRASEM series of seed drills. Using direct fertilisation technology enables micro and macro nutrients to be deposited at the same time as the seed grain. Optimum growth conditions are created during germination and help boost overall yield. A major advantage of direct fertilisation is that only one pass is necessary to apply fertiliser and sow the seed, so wheelings are reduced. A consistent seed rate in all coulter pipes is made possible by the unique distributor head to provide the conditions for optimum seed germination. This features a seed return system using the patented funnel system back into the air stream. Each coulter pipe can be switched individually using IDS, which automatically reduces the seed rate in the metering system during tramlining and half width drilling. The excess seed is returned to the riser tube via a funnel system. With contractors in mind, the TERRASEM makes it easy to create special tramlines and double tramlines. Another advantage is the completely consistent seed rate in each coulter pipe, which ensures uniform crop development and saves on seed material. Fertiliser can be applied on the TERRASEM using the Dual-Disc Exakt coulter. 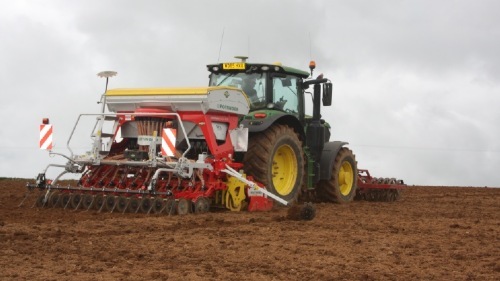 This method involves depositing fertiliser between each double row using the coulters on the compact disc harrow integrated into the TERRASEM seed drill. The placement depth of the fertiliser can be adjusted independently of cultivating and sowing depth. The surface is then packed across the whole area before the seed is drilled. The Dual-Disc Exakt coulter thus places a deposit of fertiliser in a perfect position to nourish the root of the grain. Not only does this save fertilizer and minimise unproductive losses, it also promotes faster development of the root mass and contributes long-term to optimum yield. 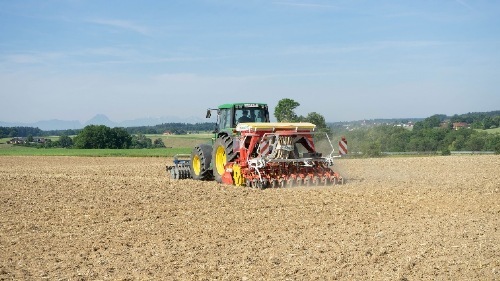 The decision whether - or which method of - direct fertilisation should be applied depends mainly on the structure of the soil, the crop and the precipitation patterns in each region. PÖTTINGER fully supports the trend in direct fertilization: in the face of increasing fertiliser prices, new types of fertiliser, new fertiliser regulations and environmental legislation, it pays to employ precision fertiliser management in future. 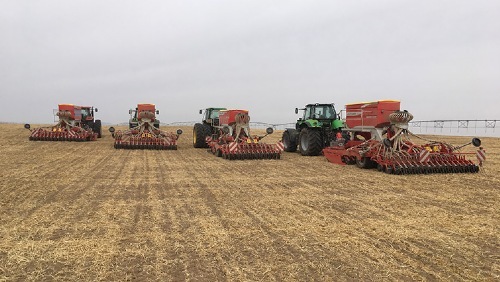 PÖTTINGER TERRASEM mulch seed drills with direct fertiliser application offer the right process for a wide range of individual needs and operating conditions.